Here’s a thing I wrote for Women Writers, Women’s Books. 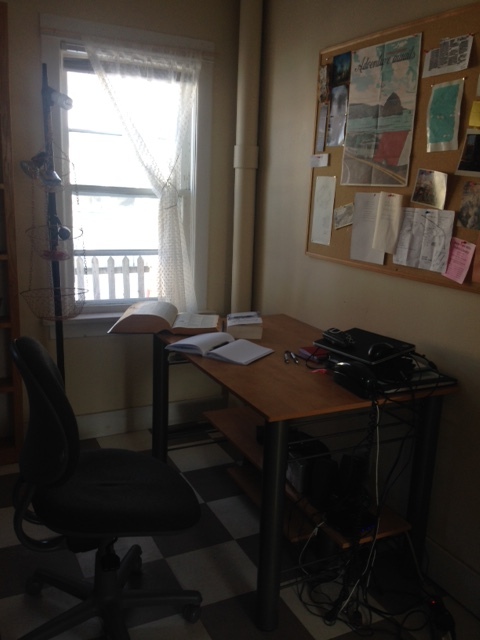 With a picture of where I did most of my writing while in Minnesota. I left there a week ago and it already seems like a glorious, delirious dream. To write stories is always to be alone in a room, with only our characters for company. But what about readers? To write presupposes their eventual existence. Yet for a writer just setting out, doubtful of success, the reader is as fictional as the rest of it. We write for various reasons. To understand ourselves or other people; to make sense of life’s randomness and injustice; perhaps to draw attention to them, or to imagine how things could be better. There is a certain narcissism too, in imposing yourself on the world, insisting on your own cleverness. The archetype of the Mary Sue represents the extreme of that wish-fulfilling impulse I suspect lives inside every writer, however artfully hidden. But also this. Most writers begin as ardent readers, children for whom the world inside a book is more real and more appealing than real life. This was true for me, well into adulthood. As I set to work on what would become my first novel, I thought a lot about what it should do for readers. I wanted it to be a place they could live in for the length of the story: fascinating, funny, full of feeling, a little mysterious. I also wanted to give back what books had given me. I am not a philanthropist, not an inventor, not the person anyone would choose to lead a committee to provide refugee relief. But if I could write a book that would let readers forget their troubles and be amused, instructed and transported – then I could say I had repaired the world in some way. My aim was grandiose, yet pure. Through years of self-doubt and bad drafts there remained that vision of a reader, picking up my novel and leafing through it, taking it home and sitting down with it. Writing was no longer about me, as it had been when I was younger. I no longer burned to prove my genius, explore my personal problems or be famous. But how I wished to delight them, those readers I did not have! I sacrificed every word that did not pull its weight, every self-indulgent paragraph, struggling to produce a story that was intelligent without being pretentious, a page-turner with a heart. When you write, you are alone in a room, until you aren’t. After I managed to interest an agent in my novel, and he managed to sell it, I was overjoyed that my hard work had been vindicated. But as I neared the goal I’d had so long, I also began to be afraid. Once my story had lived safely inside my head, then on my hard drive. Now it was going out into the world to be judged by readers, or misjudged. What if nobody understood what I’d been trying to do? My novel mixes science fiction and historical fiction, with time travelers on a spy mission to befriend Jane Austen that turns into a love story. I had taken this absurd premise and sought the historical accuracy and emotional truth within it. But I realized, too late, the premise might appear just odd. Or worse, exploitive of Austen. I realized, too late, that I was in danger of being seen as a crazed Janeite who’d written a goofy, wish-fulfilling, rip-off romance. Maybe I even had. Wise writers warn against reading your own Goodreads and blog and Amazon reviews. But I had written this thing for readers, after all, and alongside my new fear was a much older curiosity. What would they think? I had to know. My readers are no longer imaginary, but real people who exist in the world, and my feelings toward them — gratitude, amusement, mortification — are as mixed as their comments, so varied as to cancel each other out. That people can reach such divergent conclusions about the same piece of writing I must claim as a win. Yet the need for affirmation is a bottomless pit, which is why I no longer seek out reviews, though my curiosity remains undiminished. Those who loved the book I fear I can never please with another one, while those who hated it or were just “meh” confirm all my own self-doubt. I need to learn again how to be alone in a room, to look inside myself. How to strike the balance between wanting to please readers and not caring too much? I ask the question again each day, practicing how to be comfortable with the discomfort of knowing there is no good answer to this. Just as I must learn to be comfortable with not knowing what I’m doing in what I’m writing now, but press on with the faith that I will figure it out as I go along. I love this piece, Kathleen! What a forthright, clear perspective! The Jane Austen Project thoroughly astounded me. I enjoyed it so so much and I keep recommending it to people! Thanks so much, Modwyn! I am so happy you enjoyed both of them! I’m just looking at your wonderfully eclectic list of books that you read last year…some fascinating things here. thank you so much, nonalcoholicstudent!